Happy Birthday, Edgar Rice Burroughs! 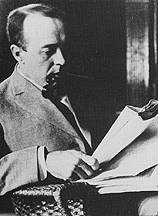 Edgar Rice Burroughs, creator of Tarzan, was born in Chicago September 1, 1875. He drifted from low-paying job to low-paying jobs--including work as a wholesaler of pencil sharpeners--until about 1911 when he began to write fiction and became fascinated with pulp fiction magazines. Burroughs wrote his very first stories while living on Chicago 's West Side. He lived in four different Oak Park residences from 1910 to 1911, and again from 1914­ to 1919, where he wrote many of his fantastic tales. His first Tarzan story, "Tarzan of the Apes", was completed in May 1912. Burroughs also wrote 22 subsequent books including parts of the "John Carter of Mars" series while living in Oak Park. He left Oak Park for the warmth of California and Hollywood, which had embraced Tarzan and would immortalize him in film. In August 2010, the Burroughs Bibliophiles held their annual gathering in Chicago to celebrate the life and works of the master of fantasy adventure. This event, which attracts participants from around the country, is dubbed the "Dum-Dum", Edgar Rice Burrough's name for the gathering of the Great Apes. In August 2011, the gathering was held in Idaho, where Burroughs lived in the late 1890's while working as a cowboy and storekeeper. The 2010 Dum-Dum included a bus tour of Burroughs' homes in Oak Park and a visit to the Historical Society's exhibit, Tarzan, Mars, and the Fertile Mind of Edgar Rice Burroughs, at its former location in Pleasant Home.